The images are disturbing. Their methods of sharing them with passersby may be to some as well. But Dysturb says they are doing the educational work that the modern Fourth Estate is refusing to do. 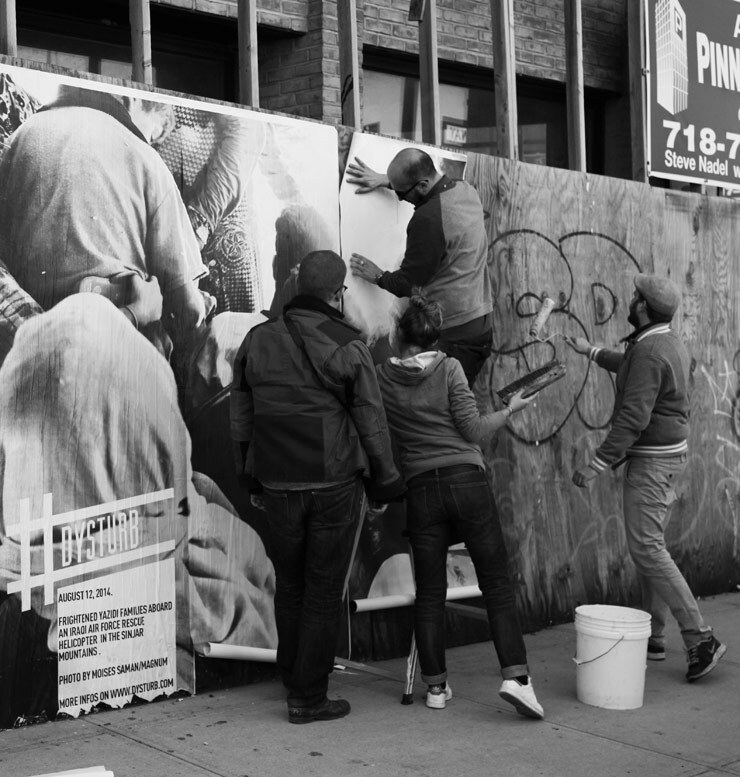 In yet one more twisting of what you thought was vandalism and what is justifiable speech in the public sphere, a new international club of wheat-pasters called Dysturb has just hit NYC with their consciousness-raising black and white photos of harrowing human scenes from around the world. 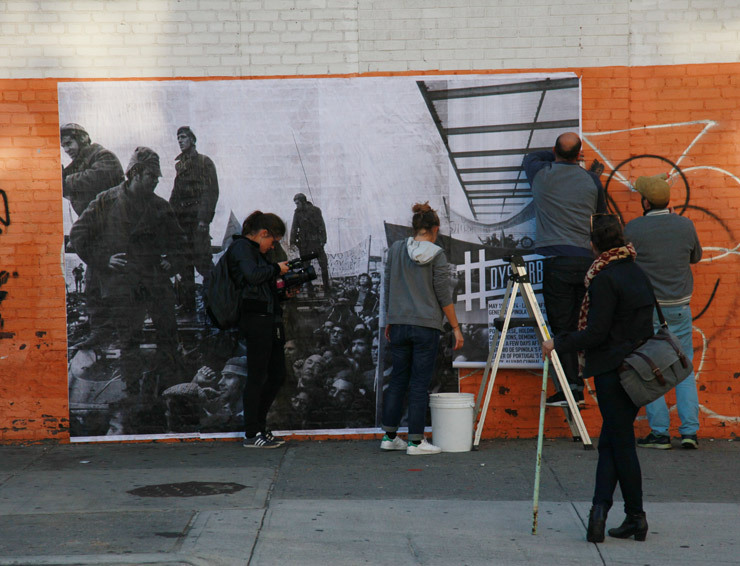 Mimicking the calculated and costly campaigns of advertisers to promote their products and brands, this work of a handful of photojournalists began hitting up walls throughout the city in mid-October while a small crowd of photographers shot their every move. 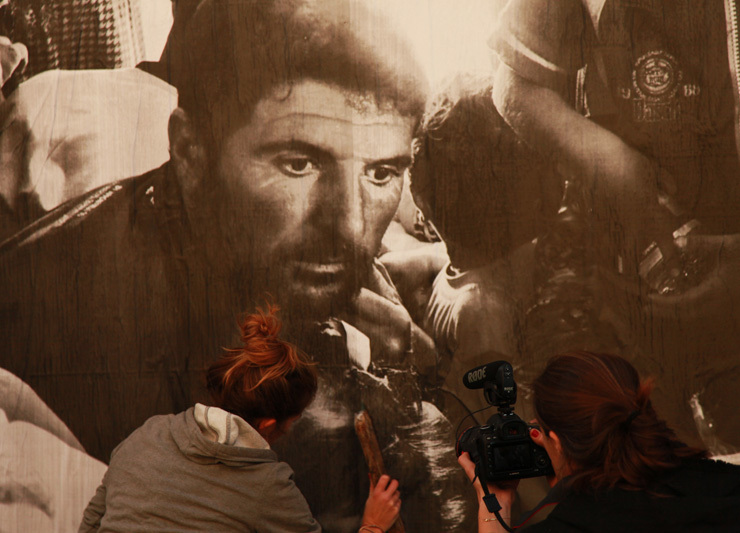 Begun by photojournalists Pierre Terdjman and his colleague Benjamin Girette, the group say their images from war-torn regions are not getting out through the large corporate broadcast, digital and print methods they once relied upon, so the dire circumstances and messages about the world they produce are simply not being seen. The often distressing and poignant scenes vary but are often of modern people suffering real life turmoil or otherwise capture transformative flashpoints of life, death, suffering and our time; refugees, the hunters, the hunted. 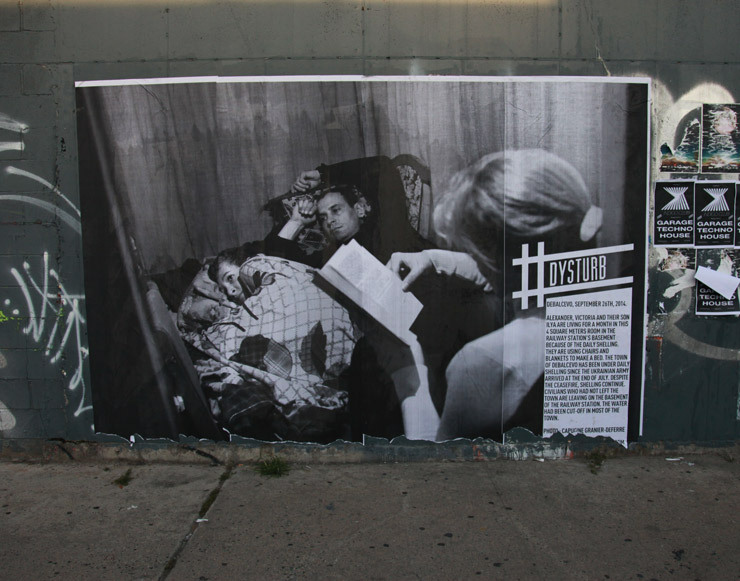 Each large scale monochrome image is stamped with the recurring brand name (and hashtag). Beneath it is a description of the image, the name of the photographer, and the URL where Dysturb can be reached. When you discover a piece like this, you spend longer studying it than a typical advertisement, and arguably you come away from it with a greater appreciation for the suffering of your fellow humans. 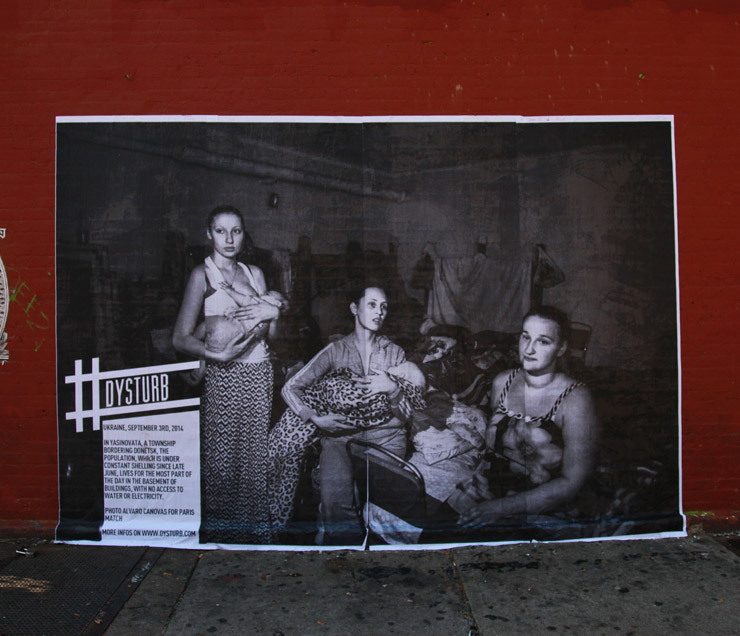 "NYC is full of insane and good ideas when you deal with media, photojournalism, and documentary photography," says Girette of the groups experience wheat pasting and meeting people while in New York, which included being invited by the Magnum Foundation to present their project during a symposium on October 18th. "The energy is incredible and that's something you're looking for when you run a project like #Dysturb." The largely French contingent began planning this campaign back in the spring and they are reported to have wheatpasted in a number of cities internationally before last weeks' New York campaign. 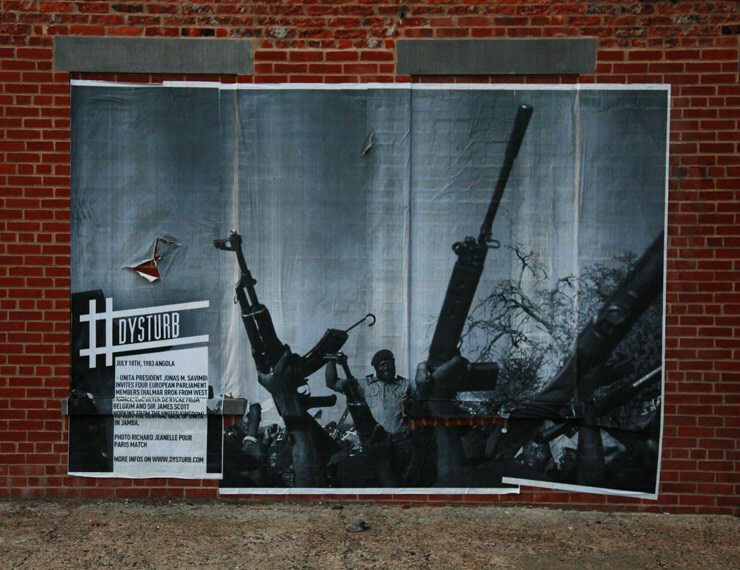 The images from around the world are stimulating and sometimes difficult and, while Dysturb says they are careful to present work that is appropriate to all ages (according to their website), most viewers will recognize the gravity of these scenes and many will have an appreciation for the assumed humanitarian goodwill that accompanies them. While understanding the journalistic intentions, you have to wonder if their openness in putting un-permissioned works up on public and private walls will backfire for these folks who are so openly transgressing local laws. BSA asked Terdjman and Girette about their experiences in New York and found that neither were familiar with the local scene and they believe their work is somehow different from what other Street Artists do because of their rigid adherence to journalistic values or other systems of internalized rules. Naturally when we hear this we think of a number of Street Artists on the streets of NYC who follow their own sets of values for exhibiting work and who with their work also address important social/political issues such as the human slave trade, torture, indigenous peoples rights, gentrification, climate change, sexual harassment, militarization of society, the banking crisis, the housing crisis, drug addiction, and a variety of other topics of great weight. 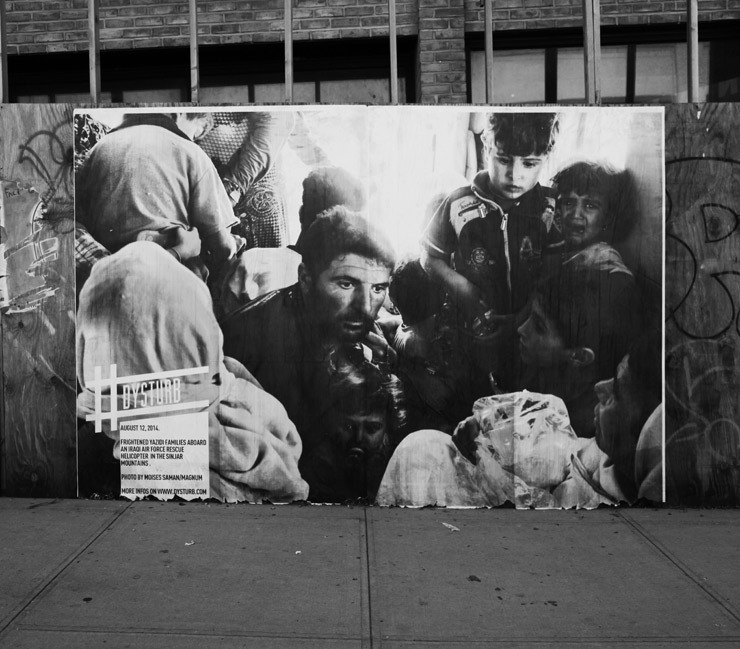 In view of Street Art's long and recent history, clearly these photographs by Dysturb are not the first or only socially/politically relevant Street Art, nor will they be the last. One other point that may raise eyebrows is a belief Dysturb states that using water based or otherwise simple-to-remove materials will exempt the act of wheat-pasting without permission from charges of illegality. This may come as news to a number of street artists who have spent long hours in jail here and have completed days of community service to satisfy a sentence -- not to mention those international street artists who report that they have experienced difficulty re-entering the country presumably because of these violations. Clearly the members of Dysturb have not run into this possibility yet, and perhaps they won't. Regardless, from the perspective of the casual passerby, the impact of this journalistic photography will be strong and impart something meaningful to the viewer. Brooklyn Street Art: Were you familiar with any other street artists who are doing political or social or educational work on the street? Benjamin Girette: Not so many! A lot of street artists amaze me every day in Paris or elsewhere when I'm traveling. I'm interested in political or social or educational work so I use to take pics of their work for myself or for my Instagram account, but I don't have names in mind. Street artists have a complete freedom for what they draw or paint or paste. I do something different, with rules for how I make the pictures I do or paste. But we do something similar when raising questions or igniting debate about human right issues for example. 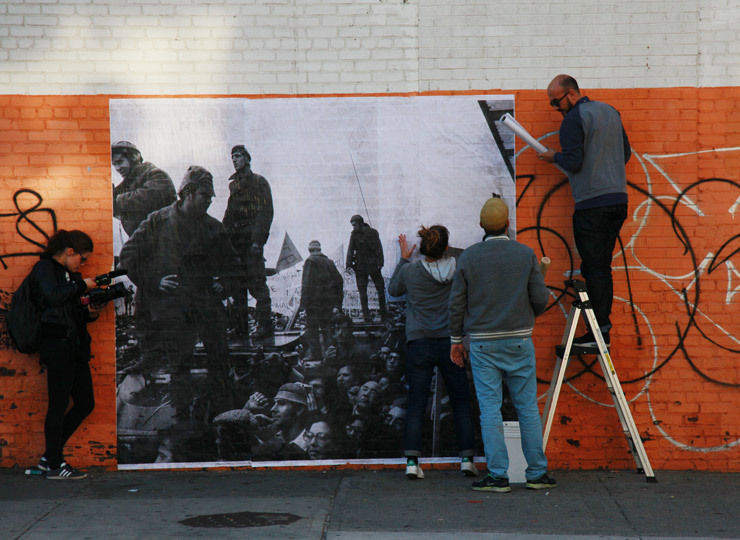 Brooklyn Street Art: How do you compare the illegal work that Dysturb is doing compared to the illegal wheat pasting that Street Artists are doing? Pierre Terdjman: We both use the same way to express something. Our goal is to get the people closer to the world we live in and as photojournalists we see with the view of reporters. 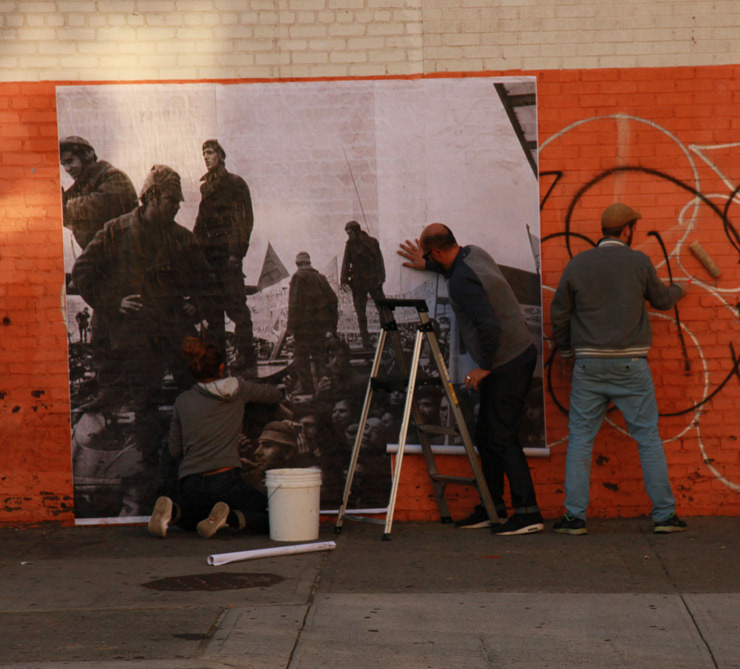 We use soft wheat paste that can be taken down easily; We don't vandalize. 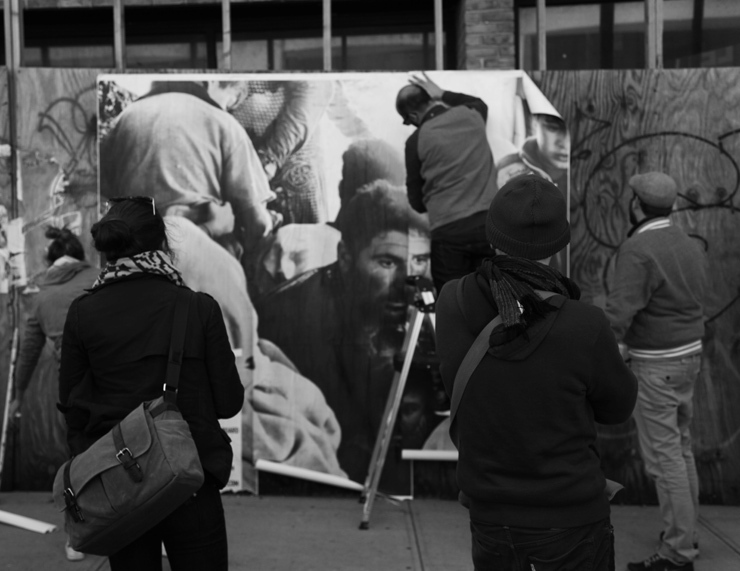 We try to use the urban space to show the pictures and we consider how the foot traffic will be in front of the pics. But again never in any way would we vandalize. 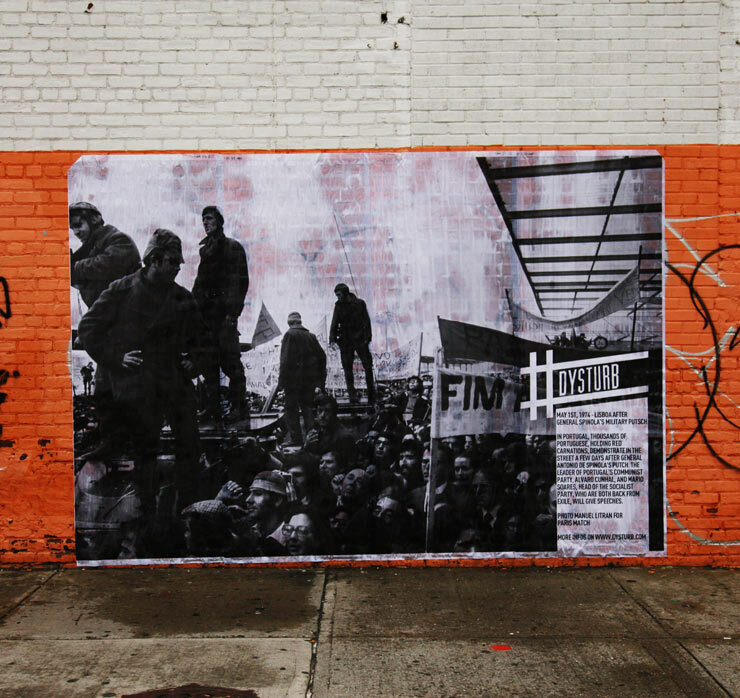 Brooklyn Street Art: How is this work different from the work of other artists who wheat paste their work without permission on walls? 1. We do not damage the wall we paste on. Water-based glue is used. 3. We always sign the posters and never run from the police. Once again the fact that we do not damage walls is protecting us. 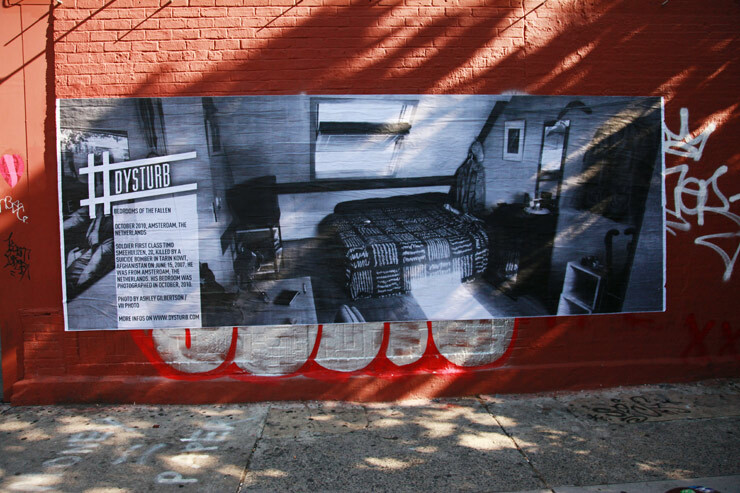 Brooklyn Street Art: Should the un-permissioned wheat-pasting of large photographic posters by Dysturb be viewed in a different way than posters from advertising campaigns? Pierre Terdjman: Advertisement campaigns are everywhere and nobody asks you, as a citizen, for the right to impose that upon you. All day you are confronted with advertisements. We take the space for something different. We are not political or militants; the goal is again to raise awareness about world issues and to educate people through journalism. This is a part of our project -- bringing #dysturb into the school yards with a specific educational curriculum is something that we are already working on.